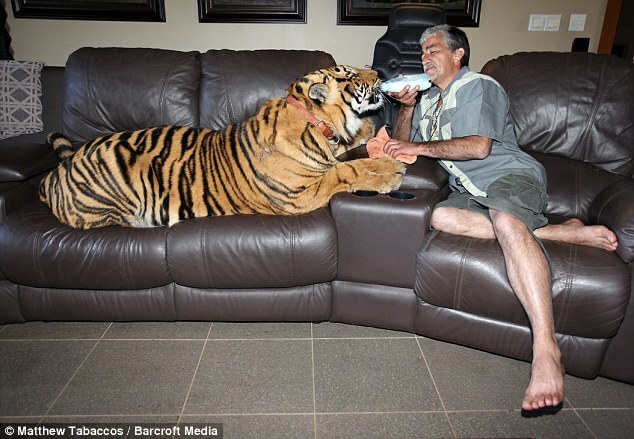 Curling up on the sofa, nuzzling his owner’s hand and teasing the neighbourhood dogs, Panjo acts just like any other family cat – except he is a 23st Bengal tiger. 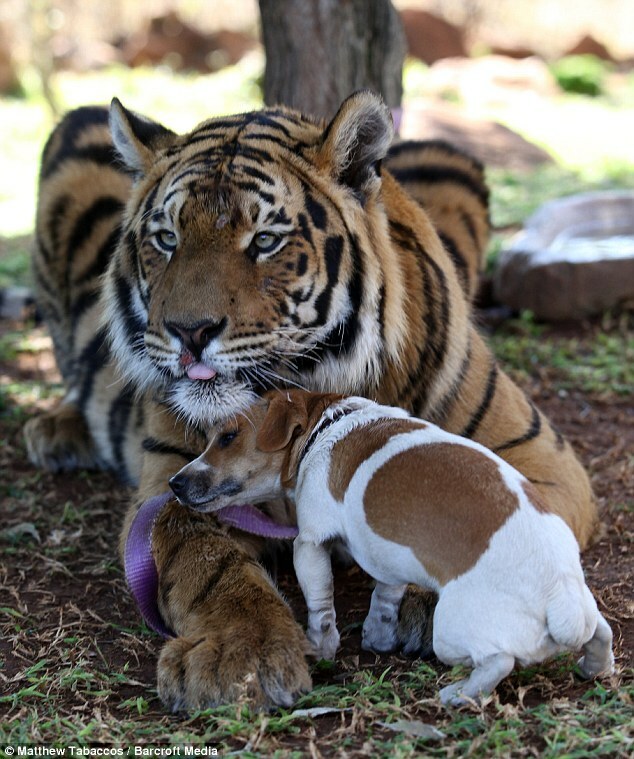 Bengals may be fearless predators when in their natural environment, but Panjo is more at home playing with Goosey Fernandes and his adopted family at thier home near Pretoria, South Africa. Panjo was hand-reared from the age of just three weeks when he was left clinging to life after being adandoned by his mother. 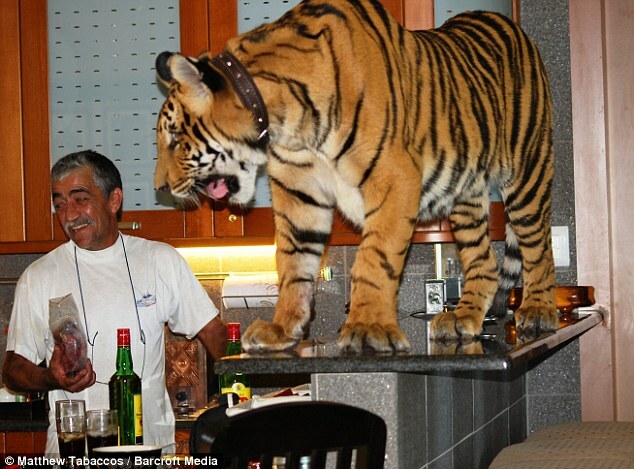 Fernandes brought him home and immediately took on the job of nurturing the tiny tiger cub, who is now 19 months old and strong and healthy. Panjo is regularly seen prowling around the house, cuddling up to its owners, leaping onto the kitchen bench and playing with Fernandes’ jack russells Milo and Sky. In a bizarre animal-kingdom relationship the trio are actually best friends. ‘He plays with them, they steal his bones, they run after each other. He has never hurt one of my dogs, they play all the time, they are good friends,’ Fernandes said. And while he already looks big enough to be more than a little bit wary, he is in fact only half the size he is likely to be when fully grown. And Panjo is just a baby at heart, still feeding largely off the bottle milk Fernandes gives him and crying at night if he is not fed. If he is really hungry he has even been known to raid the fridge. ‘The bond I have with Panjo myself and the family is something extraordinary,’ Fernandes said. Panjo’s days as a family pet are numbered because as a naturally wild animal, it might become dangerous to keep him in such a small space. 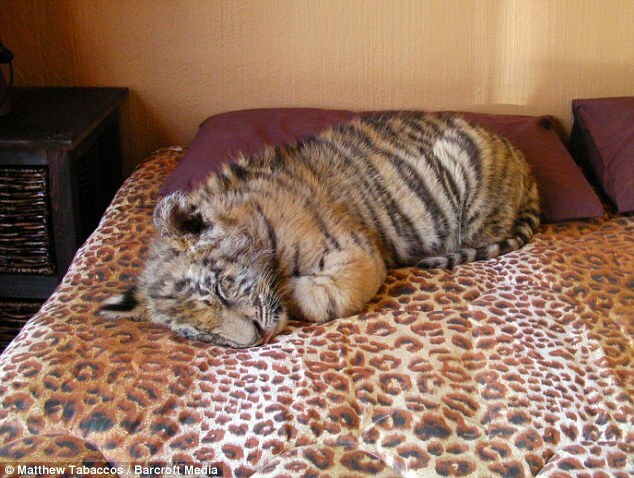 Fernandes has plans to find a mate for the tiger so he can breed.